The coelacanth (Latimeria chalumnae) is an enigmatic and important species of "fish." 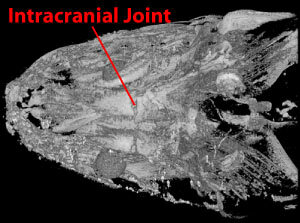 It is the only living member (along with a recently discovered second species of Latimeria) of the lobe-finned fishes, a group believed by some to be the sister-group of the terrestrial vertebrates. Together, these fishes along with lungfish (see Chirodipterus sp. ), amphibians, and amniotes are known as the Sarcopterygii. The first specimen of the coelacanth was not discovered until 1938 off the coast of South Africa. The largest populations are known from the Comoros Islands, which lie between the mainland of Africa and Madagascar. 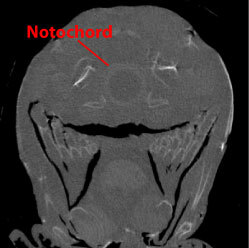 In these images from the scan you can see the characteristic notochord and intracranial joint. The fossil record of the coelacanths, or Actinistia, comprises some 125 species grouped into approximately 50 genera and four to ten families. Fossils are known from the Middle Devonian (380 million years ago) through the end of the Cretaceous (70 million years ago), when the coelacanths (and non-avian dinosaurs) were thought to have become extinct. Latimeria can reach a length of almost six feet (nearly 2 meters) and weigh up to 95 kg, but they are usually somewhat smaller, particularly the males, which average under 165 centimeters in length. They are opportunistic feeders, eating small fishes and invertebrates found in their deep reef and volcanic slope habitats. Coloration is dark blue with distinctive white flecks that can even be used by researchers to designate individuals. (Indonesian coelacanths may be more brown than blue). Scientists believe individual coelacanths may live as long as 60 years. One of the more fascinating aspects of their biology is that they are ovoviparous, giving birth to as many as 26 live pups which develop from eggs in the oviduct. The young feed off a large yolk sac until birth. Gestation is lengthy, probably 13 months. Combined with late maturation, reproduction rates are very slow and the species is undoubtably at risk of extirpation. Although the Comoran government has outlawed the capture of coelacanths, there is an incidental bycatch and black market trade in specimens due to the perceived value of the fluid in their notochord as a life lengthening supplement for humans. The discovery of the coelacanth is an important addition to our understanding of vertebrate evolution. The early phylogenetic history of tetrapods has been (in fact, still is) quite controversial. The “players” in this drama are all of the vertebrates comprising the sister group to bony fishes: lungfish, amphibians, the coelacanth, early amniotes and a variety of extinct taxa known only from fossils. The two hypotheses below represent the most common of several possible historical relationships of these taxa. This specimen, a preserved embryo (AMNH 32949), is 308 mm long. It was found off Mutsamudu in Mozambique Channel (County-Anjouan Island; drainage-western central indian coast; collected by native fishermans/G. Garrouste; field number Anthony - 62 - #26, 7/1/1962). This specimen was made available for scanning courtesy of Dr. Scott Schaefer of the American Museum of Natural History. Funding for scanning and image processing was provided by a National Science Foundation Digital Libraries Initiative grant to Dr. Timothy Rowe of The University of Texas at Austin. 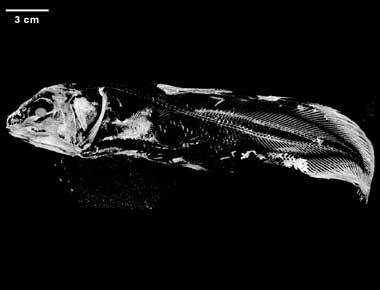 The specimen was scanned in two passes (front and back halfs of fish) by Matthew Colbert and Richard Ketcham on 17-18 April 2002 along the coronal axis for a total of 3654 512x512 pixel slices. Each slice is 0.0723 mm thick, with an interslice spacing of 0.0723 mm and a field of reconstruction of 100 mm. The front and back halves of the specimen were scanned separately. To correct for different coronal alignments of the two scans the back half was non-orthogonally resliced in Voxblast to match the slice plane of the front half. The two sets were then integrated and the slices shared by both were deleted (first set ends at slice 2083). Finally, rotational and offset errors were corrected in Photoshop. Corrective image processing by Charna Meth and Richard Ketcham. Bruton M.N. 1989. The living coelacanth fifty years later. Transactions of the Royal Society of South Africa, 47: 19-28. Forey, P.L. 1991. Latimeria chalumnae and its pedigree. Environmental Biology of Fishes 32:75-97. Fricke H. 1988. Coelacanth: the fish that time forgot. National Geographic 173:824-838. Gorr, T., T. Kleinschmidt, and H. Fricke. 1991. Close tetrapod relationships of the coelacanth Latimeria indicated by hemoglobin sequences. Nature: 351:394-397. Greenwood P.H. 1993. Latimeria chalumnae - The Living Coelananth. J.L.B. Smith Institute of Ichthyology. Hedges, S.B., C.A. Hass, and L.R. Maxson. 1993. Relations of fish and tetrapods. Nature. 363:501-502. Heemstra P.C. 1992. Conservation in the Comoros. Ichthos 34:1-2. Heemstra P.C. and L.J.V. Compagno. 1989. Uterine cannibalism and placental viviparity in the coelacanth? A skeptical view. South African Journal of Science 85:485-486. Hillis, D.M., M.T. Dixon, and L.K. Ammerman. 1991. The relationships of the coelacanth Latimeria chalumnae - evidence from sequences of vertebrate 28S ribosomal-RNA genes. Environmental Biology of Fishes 32:119-130. Meyer, A. 1995. Molecular evidence on the origin of tetrapods and the relationships of the coelacanth. Trends in Ecology and Evolution 10:111-116. Meyer, A. and S.I. Dolven. 1992. Molecules, fossils, and the origins of tetrapods. Journal of Molecular Evolution 35:102-113. Schultze, H.-P. 1994. Comparison of hypothesis of the relationships of sarcopterygians. Systematic Biology 43:155-173. Smith M.M. and P.C. Heemstra. 1991. Smith's Sea Fishes. Revised edition. Southern Book Publishers. p. 151-153. Smith J.L.B. 1956. Old Fourlegs. The story of the coelacanth. Longman Green & Co., London, 264 pp. Thompson K.S. 1991. The story of the coelacanth. WW Norton, New York, 252 pp. Thomson, K.S. 1999. The coelacanth: act three. American Scientist 87:213-215. Zardoya, R. and A. Meyer. 1996. Evolutionary relationships of the coelacanth, lungfishes, and tetrapods based on the 28S ribosomal RNA gene. Proceedings of the National Academy of Sciences USA 93:5449-5454. Zardoya, R., Y. Cao, M. Hasegawa, and A. Meyer. 1998. Searching for the closest living relative(s) of tetrapods through evolutionary analysis of mitochondrial and nuclear data. Molecular Biology and Evolution 15:506-517. 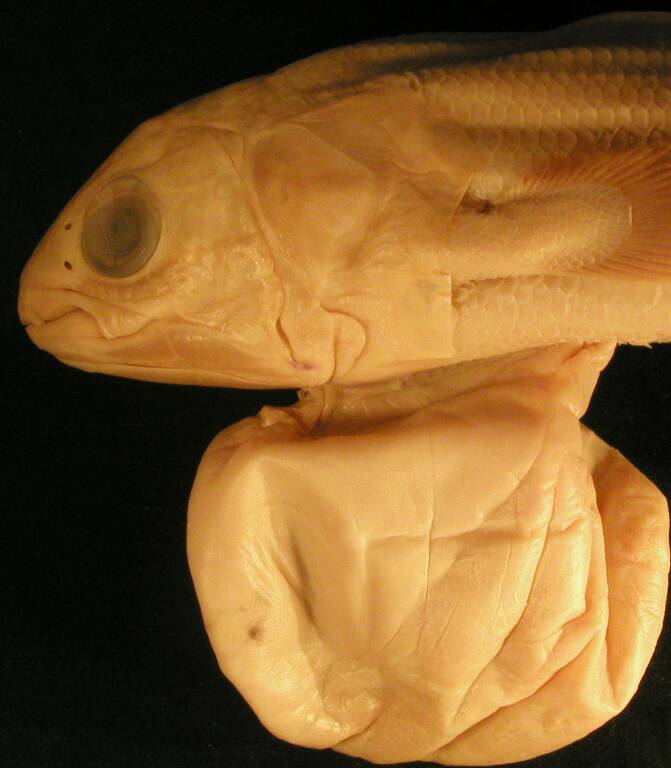 To cite this page: Dr. Julian Humphries, 2002, "Latimeria chalumnae" (On-line), Digital Morphology. Accessed April 25, 2019 at http://digimorph.org/specimens/Latimeria_chalumnae/whole/.